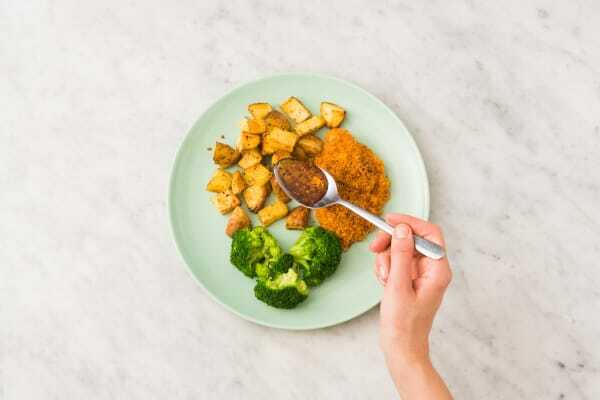 Crispy panko-coated chicken, smoky barbecue-spiced potatoes, and easy-peasy steamed broccoli are a pretty obvious recipe for dinnertime success. It’s got your classic trifecta of meat, potatoes, and veg—could you ask for much more? How about a drizzle of hot honey? The stuff combines sweet sensations with spicy good vibrations, making it perfect for taking things beyond ordinary. Wash and dry all produce. Adjust oven racks to upper and middle positions and preheat oven to 425 degrees. 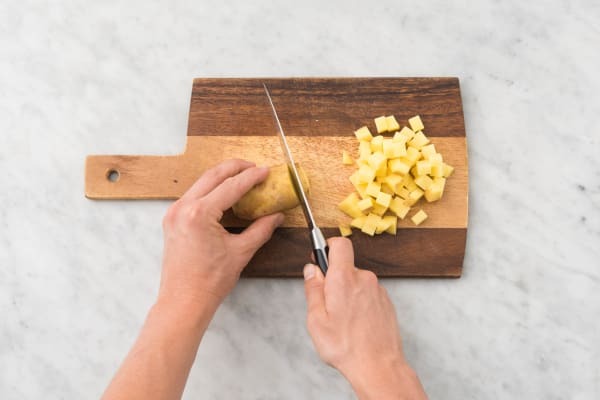 Dice potatoes into ½-inch pieces. Toss on a baking sheet with a drizzle of olive oil, half the barbecue seasoning, a large pinch of salt, and pepper. Set aside. Place 1 TBSP butter in a medium microwave-safe bowl and microwave until melted, 30-45 seconds. Stir in 1 TBSP olive oil, remaining barbecue seasoning, pepper, and a large pinch of salt. Add panko and stir again until evenly coated. Pat chicken dry with paper towels; season all over with salt and pepper. Lightly oil a second baking sheet and place chicken on it. 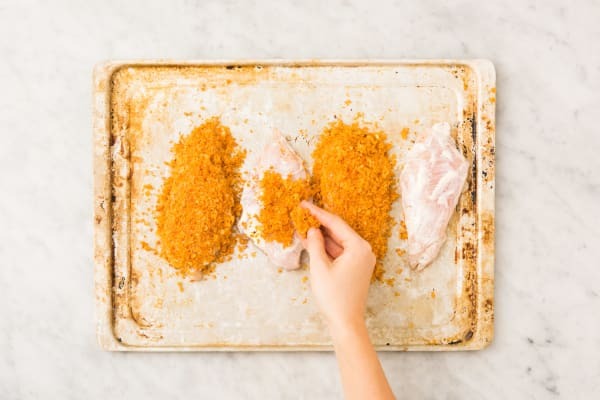 Evenly spread sour cream onto tops of chicken breasts, then sprinkle panko mixture on top, pressing to adhere (no need to coat the underside). Place sheet with chicken on middle rack and sheet with potatoes on top rack of oven. Bake until potatoes are crisp and chicken is no longer pink in center, 20-25 minutes, tossing potatoes halfway through. 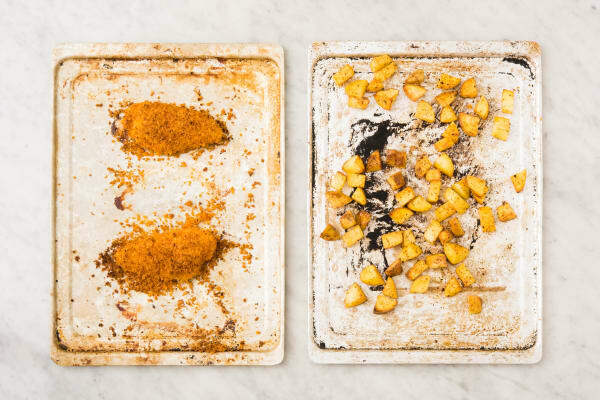 TIP: If potatoes finish first, remove from oven and let chicken bake until done. Meanwhile, cut any large broccoli florets into bite-size pieces. 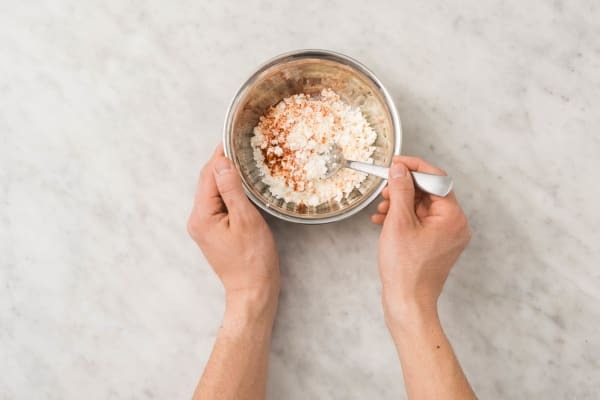 Place in a large microwave-safe bowl with 1 tsp water. Cover bowl with plastic wrap and poke a few holes in wrap. Microwave on high until broccoli is tender, about 2 minutes. Carefully remove plastic wrap (watch out for any steam). 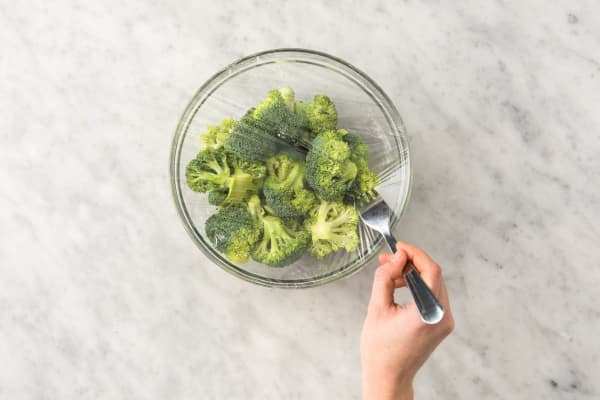 Drain any water left in bowl, then toss broccoli with 1 TBSP butter until melted. Season with salt and pepper. 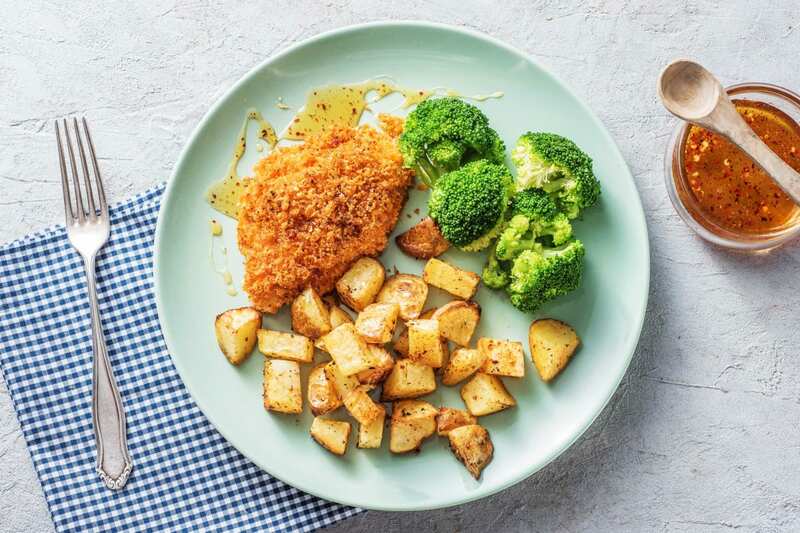 Divide chicken, potatoes, and broccoli between plates. Drizzle chicken with hot honey to taste.